What Does Your Relationship Smell Like? If he were to pick a scent for me, it would definitely be something he’d want to smell on me. So it wouldn’t be something extroverted or opulent (no MUGLER then) nor would it be something overtly feminine (which is pretty much my entire wardrobe of fragrance, but I digress). He also likes it when I’m dressed smart, with a nice jacket and fancy shoes, so the scent he’d choose to pick my half of us would be something smooth and suave – something like L’Homme Prada by Prada. This handsome and suede-like scent masculine speaks of tailored coats and sensitive souls. It smells great too! 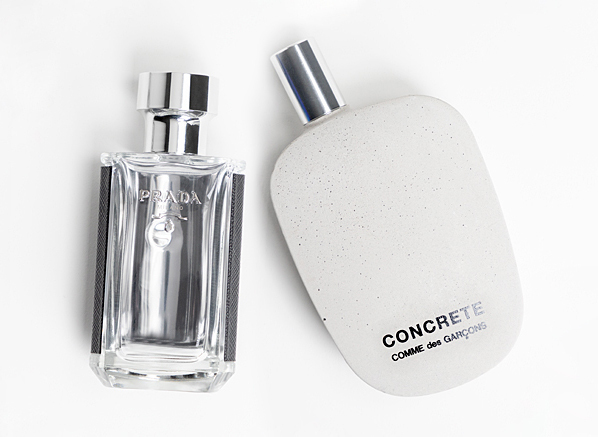 For him, I’d pick Concrete by Comme des Garcons, not because his personality represents the austere nature of brutalist architecture, far from it; in fact, it’s because it shows the contrast of his softness and strength. Nigel is kind and caring, with an approachable personality that people just like. He’s easy to talk to, and he always treats people with respect. He’s no fool though, and he has shown tremendous emotional strength at times of great hardship. 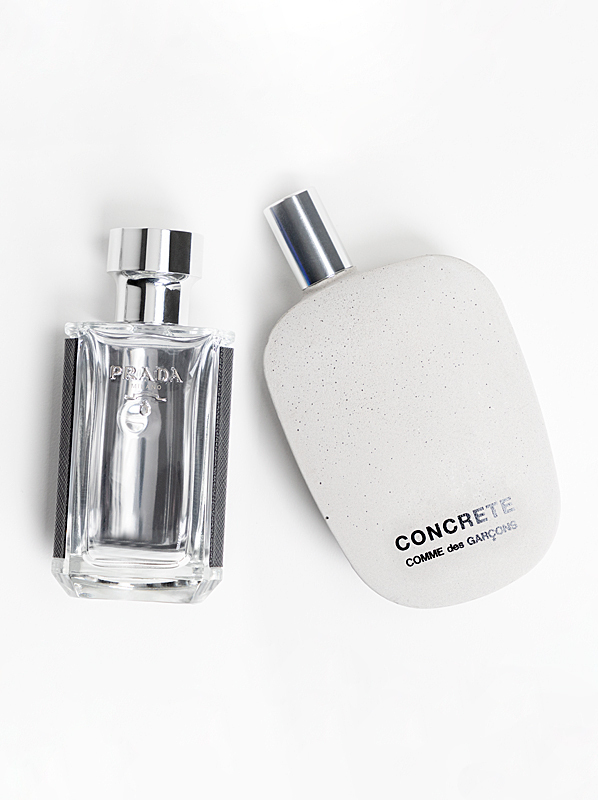 Concrete is an interplay of soft and hard textures, using rose and sandalwood to create a juxtaposing blend that is much more powdery and smooth than the concrete coating of the bottle would suggest. It’s the perfect thing for him. Our next couple is Justine & Trevor – they met through a mutual friend and according to Justine, Trevor “charmed the socks off” her. Well done, Trevor! He may snore, and she may talk while the football is on, but her kindness (and her cooking too), matched with his ability to never look down on people has made them a perfect couple. Maybe it’s the dancing and few cheeky wines they enjoy, or the quality time spent on their Friday nights spent at home, but it’s clear that they have a strong relationship built to last! Trevor’s favourite fragrance to smell on Justine is Euphoria by Calvin Klein, a seductive fruitchouli fragrance with juicy pomegranate and dark patchouli. For Valentine’s, I would pick out a scent with a similar vibe but a sunnier disposition. That fragrance would be Le Parfum by Elie Saab – a glorious orange blossom fragrance that feels effortlessly happy. There’s something so complex about this fragrance; it’s like a rich stew of florals – an exotic blend of contrasts where the solar nature of flowers is juxtaposed with the darkness of patchouli. It feels perfect for a kind person who is an excellent cook! We can’t forget Trevor, he is one half of this dynamic duo, after all! Justine likes Ralph Lauren’s Polo Black on him, so something classically masculine seems to embody this guy that likes to help people. 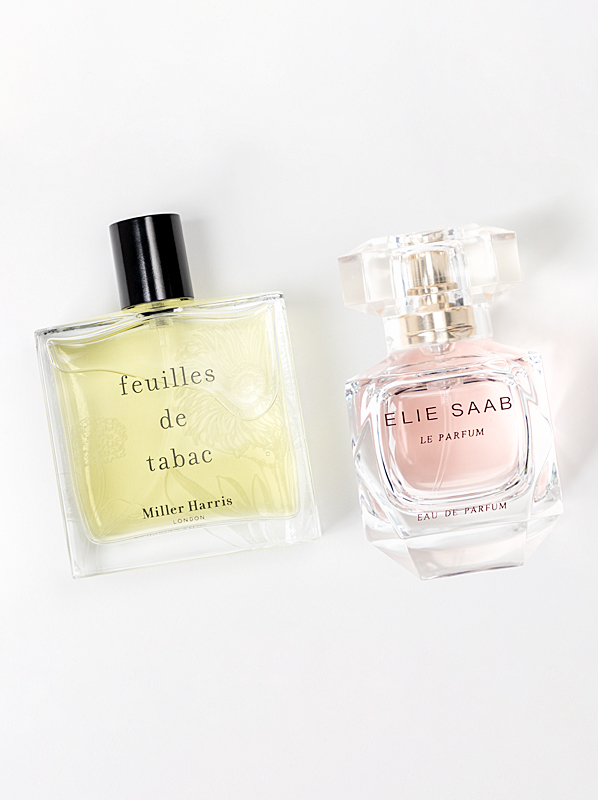 When I think of the perfect gentleman, I think of Feuilles de Tabac by Miller Harris. This handsome blend of woods, tobacco leaves, and spices speaks of a complex character that is open and inviting. It’s the sort of scent that you want to keep smelling – which is perfect for the type of guy you want to keep spending your time with, and seeing as Justine and Trevor have been together for 28 years, I’d say that he’s a keeper! Sophie and Dwayne are our final couple, and they definitely fit the bill as a modern couple. First off, they met online, which is the way many people meet these days and have been together for 2 1/2 years. They are long distance and therefore, every moment spent together is precious, so what they do, or where they go doesn’t matter, just as long as they go there and do it together. She calls him her “peace on Earth” and he says she’s his “support system”, and while she may ask him lots of questions, and he may be a little bit stubborn at times (her words, not mine) they have crafted a relationship based on love, laughter and loyalty. Good on them! Dwayne likes Sophie to wear sweet fragrances – perfumes with prominent notes of vanilla and jasmine. So we need to pick something with a sugar hit but also something with a big impact – a distinct scent that he can smell when they’re not together to remind him of her. How about Flowerbomb by Viktor and Rolf? This is essentially candy floss in a bottle, and as the name suggests, it’s a mushroom cloud of a fragrance with remarkable tenacity and throw – in fact, one spritz could be enough to travel the distance between them! So Flowerbomb it is! And now for Dwayne – Sophie says she likes it when he wears something “light but masculine”, which is essentially the polar opposite of Flowerbomb, let’s be real. 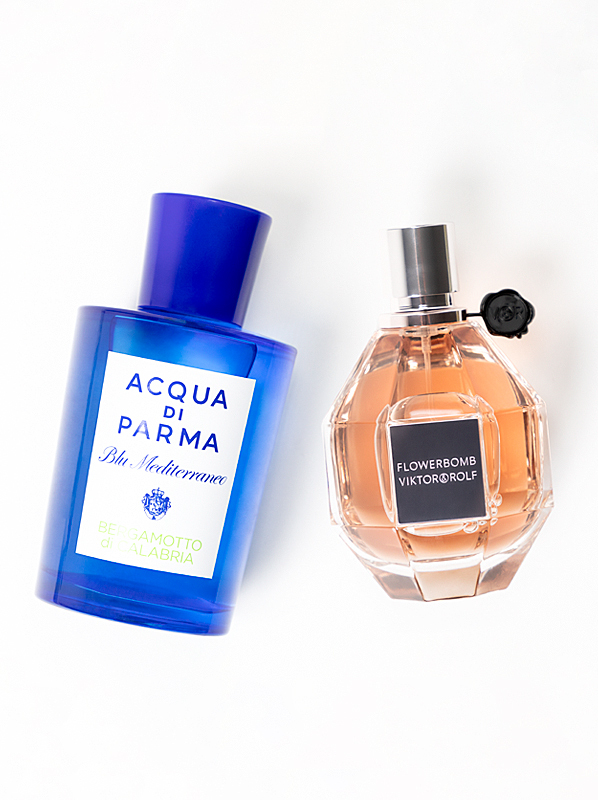 For Dwayne, I’d pick the mouthwatering, zesty Bergamotto di Calabria by Acqua di Parma. Inspired by the expansive bergamot groves of Calabria, Italy, this is a refreshing fragrance with a delicate trail that smells like luxurious citrus notes. It’s a cool, hesperidic cologne that smells superb on any guy who wears it. I reckon he’d smell great in it! This entry was posted on Friday, February 8th, 2019 at 7:16 pm and is filed under Ask The Expert, Candy Perfume Boy, Fragrance, Gifts, Hints & Tips, Lifestyle, Men, Tried & Tested, Valentine's Day. You can follow any responses to this entry through the RSS 2.0 feed. You can skip to the end and leave a response. Pinging is currently not allowed.